Oklahoma Connection | Hefner came to Ardmore, Oklahoma, as a lawyer in 1906. The biography The Judge: The Life of Robert A. Hefner was written by Clifford Earl Trafzer and became the first in the award-winning Oklahoma Trackmaker Series published by the Oklahoma Heritage Association. Robert Alexander Hefner, Sr., was born in Texas and attended North Texas Baptist College and graduated with a law degree from the University of Texas in 1902. 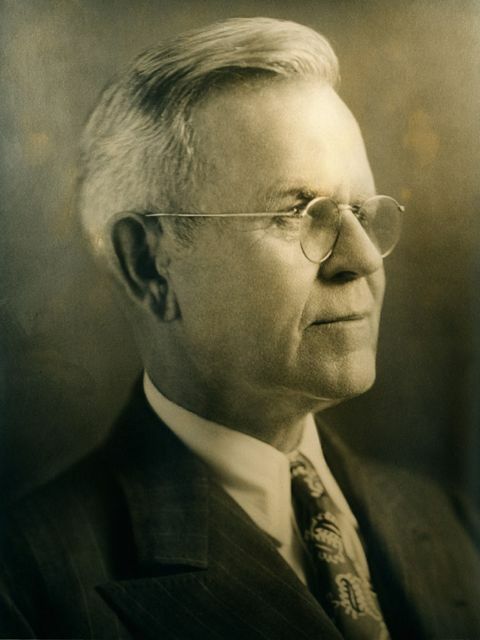 He opened his first law practice in Beaumont, Texas, married Eva Maurine Johnson in 1906 and came to Ardmore, Oklahoma, where he served as mayor for eight years. Judge Hefner came to Oklahoma City to serve as a Justice of the Oklahoma Supreme Court (1927-1933) and was elected mayor of the city from 1939 to 1947. He organized The Hefner Company in 1933 as a family partnership engaging in the development of oil and gas properties. Judge Hefner donated his family’s Oklahoma City residence to the Oklahoma Heritage Association in 1970, the home was the Association’s headquarters for more than 30 years. See pictures of Robert A. Hefner, Sr. and other media HERE.